Most people have been led to believe that the 7 angels with the 7 trumpets in the Apocalypse (Revelation) are going to appear, in the distant future, at the end of time and blow their trumpets. The 7 angels are 7 time periods and the first 5 have already gone, with the 6th. (Rev. 9 v 12) IMMINENT and the 7th. being the LAST, for most of mankind. Are YOU ready? Don't be so sure. When a trumpet sounds, the next time period begins, just like when the bell rings to start the next round in a fight. The 3rd. angel (Rev. 8 v 10) happened in 1986 "and the name of the star is Wormwood." Chernobyl is in the Ukraine and in Ukrainian Chernobyl means Wormwood. However, this Booklet is concerned with only the 5th. time period - the 1st. of the LAST 3 WOES that come upon the inhabiters of the Earth - YOU. 1. "And the 5th. angel sounded, and I saw a star fall from heaven unto the earth and to HIM (the star or small beam of light is a PERSON - a Being of Light) was given the key to "the bottomless pit"; and there arose a SMOKE out of the pit, like (as) the smoke of a great furnace; and the sun and the air (sky) were darkened because of (by reason of) the SMOKE of the pit." 3. "And there came out of the SMOKE, LOCUSTS (but these are not locusts, they are flying machines that looked like locusts to John and he goes on to describe them later, in verses 7-10) upon the earth: and to them was given power, like (as) the SCORPIONS of the earth have power. 4. And it was commanded them that they should not hurt the grass of the earth, neither any green thing, neither any tree; but only those men who do not have the seal of God in their foreheads (telepathic contact with God). 5. And to them it was given that they should not kill them, but that they should be tormented 5 months: and their torment was like (as) the torment of a scorpion, when he strikes a man (the TORMENT when a scorpion strikes a man is that he does not know whether he is going to LIVE or DIE). 6. And in those days men shall seek death, and shall NOT find it; and shall desire to die, and death shall flee from them." Now we come to the description of the "LOCUSTS" and I will come back to verses 3-6 and explain them later on when I have shown you what the LOCUSTS and the SCORPIONS really are, so that the description of what they do will make more sense to you, afterwards. 7. "And the shapes of the LOCUSTS were like unto (similar to) horses prepared unto battle; and on their heads were as it were (what looked similar to) crowns like gold, and their faces were like the faces of men. 8. And they had hair like the hair of women, and their teeth were like the teeth of lions. (metal); and the sound of their wings was like the sound of chariots of many horses running to battle. 10. And they had tails like scorpions tails, and there were stings in their tails: and their power was to hurt men 5 months (tormenting them)." So these "LOCUSTS" were like unto "horses prepared for battle." In John's day the only type of mobile military machine was an armoured-horse (prepared unto battle) or an armoured-horse pulling a chariot. However, these "horses prepared unto battle" were flying (locusts fly), and so he was shown flying war-machines, that had what looked similar to a crown of gold on their heads; faces like the faces of men; breast-plates of metal; the sound of their wings was like the sound of chariots of many horses running to battle; tails like scorpions with stings in them. Saudi Arabia is very sunny and with the sunlight on the rotor-blades, looking down on them flying, it would (and did) appear like a crown on the locust's (helicopter's) head. Looking at them from the front with the two windows (eyes); the nose and some had a mouth with teeth like lion's teeth painted on them; they looked like a face, but also, men sit in them and they certainly have faces like the faces of men. John said they had breast-plates like breast-plates of iron (metal) because they are made of metal (aluminium) and he didn't say aluminium because it had not been invented then and wouldn't be, for almost 2000 years into the future. The sound of their wings was "like the sound of chariots of many horses running to battle." The only flying-machine that sounds like that is a HELICOPTER. The verse that causes the most confusion and would prevent most people from recognising the LOCUSTS as helicopters is verse 8 because of the reference to them having hair like the hair of women. Helicopters do not have hair like the hair of women - but in the Gulf War they did. The key is in the past. In John's day all the women, except those in disgrace, had very long hair because they were not allowed to cut their hair short. If they were in disgrace their hair was cut for them, as a sign that they were in disgrace. A lady's hair was known as her glory and her "covering". The operative word here is "covering" and that word is the key to the riddle. John was shown the helicopters flying, with the sun on their rotor-blades which made them look like "crowns like gold", but he was also shown them on the ground, where they were kept under camouflage nets that hung down to the ground and was their "covering". 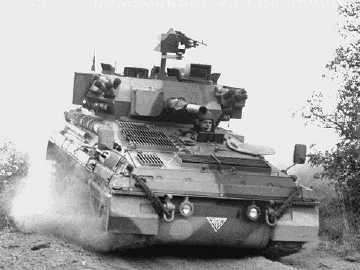 The "SCORPIONS" were armoured ground vehicles and the IRONY is that the British armoured vehicles are actually CALLED "Scorpions". Now it is time to return to the verses (3-6) that I promised earlier on to return to once we knew what the "locusts" and "scorpions" were, and to see how accurately the prophecy fits the Iraq - Kuwait Gulf conflict of 1990/91. The U.S.A./ U.K. and allies were building up their military capability for weeks but as soon as Saddam's forces set fire to the 1000 oil-wells and the SMOKE appeared, the allies moved immediately against the Iraquis and the LOCUSTS (helicopters) and SCORPIONS (armoured vehicles) came out of the SMOKE, just as John wrote it 2000 years before it happened. During the Vietnam War the U.S.A. "carpet-bombed" and used "agent orange" (a defoliant) and "napalm" (fire) both of which caused a great deal of damage to the vegetation (greenery). This time, using laser and video-guided weapons with precision "pin-point" accuracy, the allies hit only exactly what they aimed at and did not destroy the vegetation. "Men shall seek death and shall not find it." During the build-up, the allies were "gung-ho" and ready to die but when the time came they did not DIE. On the allies side virtually all of the fatal casualties, and there were only about 16 of them, were caused by "so-called" "friendly-fire". If there can be such a thing. The torment lasted for 5 months with the combatants not knowing whether they were going to live or die. 11. "And they had a king over them, which is the angel of the bottomless pit, whose name in Hebrew is Abbadon, but in Greek his name is Apollyon." The words Abbadon and Apollyon, both, when translated into English, mean "the Destroyer" - "the angel of the bottomless pit" - SATAN. Saddam, like others before him (Hitler; Stalin; etc. ), is merely a glove-puppet for Satan and does the bidding of his master, Lucifer, "the angel of the bottomless pit" - Satan. Only the "Destroyer", who wants to, and is trying to, kill YOU and has vowed to destroy ALL of you and take YOU with him into the "FIRE", would be that crazy. The environmental damage that the oil-smoke alone has caused and is still causing (it has diluted and spread-out but it is still there) is incalculable. It has been and still is a major factor in the acceleration of the "green-house effect" and the changing of the global climate, with the havoc and destruction it is continuing to cause. During W.W.1. the "mustard-gas" that was used was sulphur-gas and it burned the lungs and the skin of those exposed to it. The moisture in the lungs turns sulphur-gas into acid and sweat on the skin does the same. One WOE is past; and behold, there come two WOES more hereafter (the 6th. time period which is imminent NOW and the 7th. or LAST WOE - the REAPING of the earth) in which 99.9% of mankind will go into the "FIRE". Some of the details of the 6th. time period are in my Booklet - "The Four Horsemen of the Apocalypse and the Two Witnesses" and the ONLY Survival-Plan is in my Book - "The Way home or face The Fire". You really have NO time to waste and you ought to read it now!